The story and message of the Bible distilled into 70 scenes, plain yet profound in its telling, geared for people of all ages. P.D. 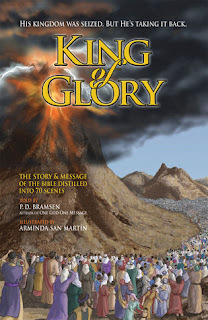 Bramsen takes a unique approach to the retelling of the Bible in his book King of Glory. Geared for all ages, there are no preschool style writings or illustrations. Some of the material may even be a bit mature for youngsters, but what better way for them to gain the wisdom than at your feet. Excellent for family devotions as each page gives the Biblical account and has a beautiful illustration by Argentina artist Arminda San Martin. 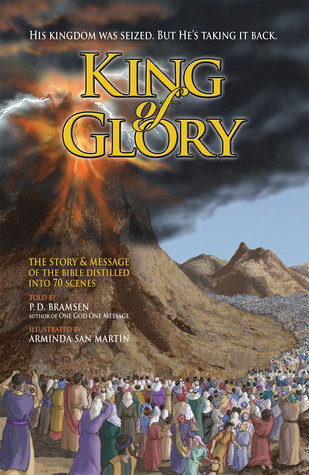 Divided into scenes like you would see in a play or script, P.D Bramsen is able to articulate each one in a profound way to lead the reader to desire more of the scriptures. He includes scripture in each scene, and includes his retelling from the Word. The scenes are not watered down or glazed over, revealing the truth of the need for our Savior. The book concludes with 4 messages from the story. Happily Ever after?, The bad news, The good news, and Your response to the King which walks the reader through the plan of salvation. There are also review questions for each scene to reinforce participation. Visit Paul’s website at www.one-god-one-message.com to see more about his ministry. Going to have to check out these web sites. Melanie, thanks for taking time to review KING of GLORY on your beautiful blog as well as on GoodReads and Amazon. I am excited about how God is using this tool (and will use it as it becomes available later this year in Arabic, French, Spanish, Turkish, etc, and as we turn it into a Ken-Burns effect movie (2013) http://www.youtube.com/watch?v=UTJa8xbBlVA Thank you for helping to spread THE WORD via your reviews and blog.